Canvas has a selection of superb campsites close to Venice, all perfectly located for day trips to this endlessly fascinating city, and for enjoying traditional Italian seaside culture. Our Venice campsites are ideal if you love watersports - they all have excellent pools and direct access to great beaches! Venice Needing no introduction as one of the most romantic cities in the world, the city of Venice is made up of dozens of individual islands. 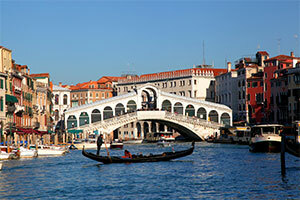 Tour the Doge’s Palace and walk over the Bridge of Sighs, and take a vaporetto (water bus) to see the Grand Canal. Visit the Murano glass-blowers or buy lace on the island of Burano. Avoid the queues at St Mark’s Basilica by booking your entry time online. Treviso About half an hour north of Venice by car or train, Treviso is another town of romantic canals. Its pretty streets are lined with arcaded walkways and frescoed houses. Explore the medieval churches, meander through a warren of lanes, and visit the museum housed in an old monastery. Parc Zoo Punta Verde A beautifully laid-out zoological garden with everything from lions to lynxes, gibbons to giraffes, and camels to capybaras. The original habitat of each species is recreated using plants and thermal water sources. Lido di Jesolo A lively and popular seaside town along a ten-mile beach of golden sand. Sun beds and parasols can be rented by the day and there is an ample supply of beachside bars selling ice cream, drinks and salads. Take a trip on a ‘pirate galleon’, and buy some buccaneering souvenirs to bring home! Aqualandia With the highest water slide in the world and Europe’s highest fixed bungee jumping tower, Aqualandia is proud to be Italy’s number one water park. Take a break from the adrenaline-fuelled excitement by seeing one of the professional shows or visiting Funnyland, the ‘park in the park’ created for kids from 3 to 12 years. Ravenna Ravenna’s basilicas and exquisite mosaics are a legacy of its Byzantine past. The Basilica of San Vitale is the best known of the city’s early Christian buildings which together have been designated a UNESCO World Heritage site. The city is also home to the popular Mirabilandia amusement park. To find your perfect campsite in Venice please use our interactive site finder, call our knowledgeable customer advice team on 01 242 1901, or go straight to the individual campsite pages.